“Most important discoveries or creations are accidental…” I’ve come across this phrase or something similar many times. A quick Google search reveals that it is even showing up on standardized tests in writing prompts given to school kids. Not only is the statement just plain wrong, but it gives a terrible impression of what scientists do. To dispel the notion that you can just tip over a beaker and change the world, I will dissect the phrase and analyze its flaws. We’ll begin with the very first word: “most”. That's a pretty bold claim. All over the world, there are scientists working every day in diverse settings: universities, private industry, non-profit organizations, hospitals, government labs, and the list goes on. I have no idea how to even begin to estimate the number of scientists in the world. Now, every month legions of scientists publish their discoveries in hundreds of peer-reviewed journals. It’s pretty hard to imagine that most of those discoveries happened by accident. LOL! We have no idea what we're doing. Image Credit: compiled by user: JSquish, wikimedia commons. Moving on to the next word: “important”. Now, not every discovery or creation is what you (or the author of the original statement) might call important, but how can you tell if it is? Is the Discovery of a Novel, Potent, and Src Family-selective Tyrosine Kinase Inhibitor really that important? Well, if you study how cells use energy, then it’s probably very important. If you look on Google Scholar, you’ll see that almost 1700 other publications have cited this paper as a part of their own work (that’s really impressive, by the way). I suspect, however, that the author was probably thinking about things that are important to humanity as a whole, like penicillin, the microchip, or Thermus aquaticus. The bacterium that changed genetics (and criminal investigation shows) forever. Image Credit: Diane Montpetit (Food Research and Development Centre, Agriculture and Agri-Food Canada), wikimedia commons. Wait, what the heck is Thermus aquatics? Why, it’s the bacterium that helped the Human Genome Project (the mapping of every human gene) to finish two years ahead of schedule. When microbiologists discovered this little microbe living in the geysers of Yellowstone National Park in 1969, I can't imagine they fully grasped the impact it would have. It wasn’t until decades later that another researcher figured out how to use an enzyme from T. aquaticus to replicate DNA in a beaker (a process called PCR or polymerase chain reaction). In addition to the Human Genome Project, PCR is used for DNA fingerprinting, identifying infectious or hereditary diseases, phylogeny, and nearly every episode of CSI. Kary Mullis and Michael Smith shared a Nobel Prize for the development of PCR, but should we call the discovery of the bacterium that made it possible “important”? Finally, we come to the heart of the matter: the idea that the discoveries and creations can be truly accidental. Accidents can lead to some amazing observations, but that's only the beginning of the scientific process. It takes education, insight, and a lot of work to get something worth calling an important discovery. Perhaps the most popular story of accidental discovery is Alexander Fleming’s discovery of penicillin. The story goes that Dr. Fleming took a vacation with his family in August 1928 and left some cultures of Staphylococcus sp. (a bacterium that he had been studying) on his lab bench. When he returned, he found that one of the culture dishes had been contaminated with a mold (Penicillium rubens) that had killed the bacteria. Thus, penicillin was accidentally discovered. Take a look at that lab bench. The really amazing thing is that only one dish was contaminated by mould. Image Credit: wikimedia commons. Here’s what’s missing from the story. People had already known about the antibacterial properties of moulds and fungi for quite some time. What Fleming realized was that the P. rubens had produced a substance that inhibited the growth of the bacteria, and that the substance could be isolated and used to treat infections. He spent the next several months culturing the P. rubens and extracting the “mould juice” (his name for the substance before coining penicillin). He then spent the next eleven years conducting clinical trials and additional research before he abandoned the work in 1940. That’s right. Alexander Fleming gave up on penicillin. He considered it little more than a laboratory curiosity with little or no practical use. It wasn’t until Ernst Boris Chain and Edward Abraham figured out how to purify the antibiotic and Norman Heatley suggested the method for stabilizing it that they had a drug ready for testing. Even still there was no practical way to use it until a whole team of researchers (at one point, the entirety of the Sir William Dunn School of Pathology at Oxford) developed a method to mass produce it in 1945. So really, the only accident involved was the contamination of the bacteria cultures (which was a truly extraordinary series of coincidences). The rest was the product of focused research by a lot of people with a lot of training and education. 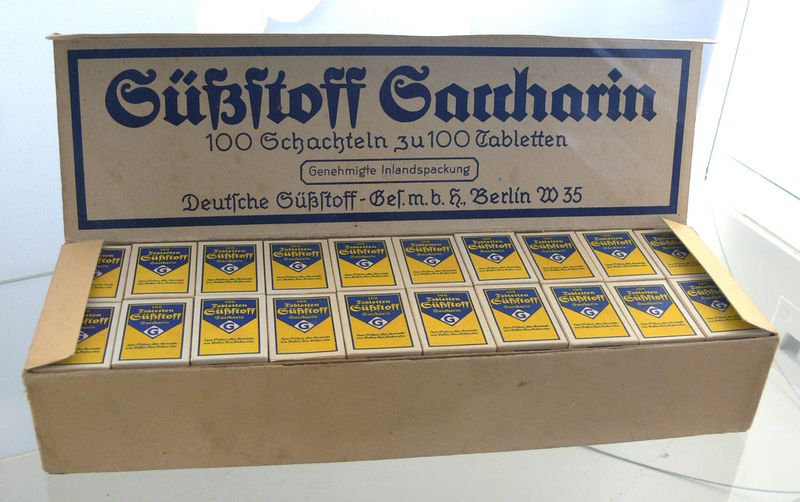 Saccharin, the first artificial sweetener. Remember to always lick your fingers after working with chemicals. That's how science happens. Image Credit: user FA2010, wikimedia commons. There are dozens of other stories that get brought up as examples of accidental discoveries. However, if you look closely, you'll see that they all have one thing in common: someone (often many people) put in countless hours to bring about what we recognize as a discovery. I will grant that there are some discoveries that were much more accidental. Saccharin and aspartame were both discovered by chemists who didn't wash their hands after working in the lab. Even these accidents would have meant nothing were it not for the chemists that were able to figure out what they were tasting and how to recreate it. They were also lucky that they discovered sweeteners, and not neurotoxins. Most people who ingest lab chemicals end up like Carl Wilhelm Scheele who liked to taste his discoveries and died of mercury poisoning. My main goal with this post was to dispel the idea that science simply happens by accident. I hope I've done that. Science is a process that begins with an observation, which raises a question, that prompts a hypothesis, which is tested by an experiment, that produces another observation. Sometimes the steps are reduced; Questions may be reflexive like "What on Earth is that smell? ", or "Why is that bird flying backwards?". Experiments are sometimes entirely cerebral (that's how theoretical physics works). The steps may not always be apparent, but we go through them nonetheless. So, why there are so many anecdotes of unexpected discoveries and so few about intentional discoveries? The answer is really simple. They make for better stories. Microbiology professors love to gather their students around the Bunsen burner to tell the tale of Alexander Fleming and his fateful encounter with Penicillium rubens. It's far more entertaining than Jack Kilby's invention of the microchip. You see he wanted to find a better way to fit more electronic components into a smaller area... so he did. He embedded the transistors, resistors, capacitors, and the associated wiring into a germanium that could be inserted into a computer. It's safe to say that the microchip is one of the most important inventions in recent history (it made it possible for you to read our blog after all), but Kilby's story just isn't as riveting Fleming's. If you ever hear someone make the claim that “Most important discoveries or creations are accidental…”, just think of Alexander Flemming, Ernst Boris Chain, Edward Abraham, Norman Heatley, the Sir William Dunn School of Pathology, and how they accidentally spent seventeen years discovering penicillin. The True History of the Discovery of Penicillin be Alexander Fleming. Diggins, Frank. reprinted in Biomedical Scientist, March 2003.